Some may say that my home screen is too busy, but this is, uh, actually toned down. I used to have busier seascape pics from the Google Wallpapers app but switched to the cityscapes instead which are still...bright. Sometimes. I even got rid of my folders! 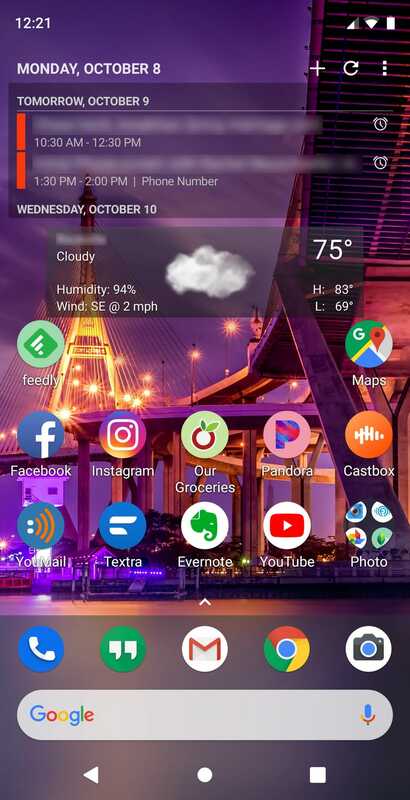 I worked hard in tweaking my home screen widgets and the assorted transparency layers in Nova Launcher Prime to be cohesive. And I used to have a bunch of folders on my home screen but I used the app drawer folders to consolidate the drawer, and only put my most used apps on the home screen, of which there are still several. And yes I do still have the Photo folder on the phone screen but I’m a photo nerd and have my most-used but not all my photo apps in there. The main camera icon and the double-press power button launch Google Camera (Arnova’s v8.3b1), but the Photo folder has the stock Essential camera app for portrait and B&W modes, FlashAir for zapping photos over from my good camera, Google Photos and Snapseed. Ignore the part where the background doesn’t line up, that’s an artifact from the scrolling screenshot made by LongShot. Scrolling screenshots were a cool idea I liked from Samsung and while having a separate app isn’t as slick, it works well enough and I might even pay to remove ads. I very rarely pay for apps so take that as you will.